Hey, there I have come with the guide on How To Unlock Bootloader, Root Honor 8C And Install TWRP Recovery. You can easily Root Honor 8C, Unlock Bootloader & Install TWRP Recovery. Honor 8C was recently launched and there are a lot of developments going around. We will keep updating you on Custom ROMs, Custom Kernel for Honor 8C. This Honor 8C is having a 6.26 Inch HD IPS LCD Screen which is protected by Gorilla Glass (unspecified version). Honor 8C is powered by the Qualcomm SDM632 Snapdragon 632 which is an Octa-core processor. It has 4GB of RAM and 64GB of Internal Storage. It’s a dual-SIM device (Nano-SIM, dual stand-by). Moving to the OS this device runs on EMUI 8.2 based on Android 8.1 Oreo. If you are a Huawei user then you might know that Huawei provides unlock code for free but now you have to pay to get unlock code. 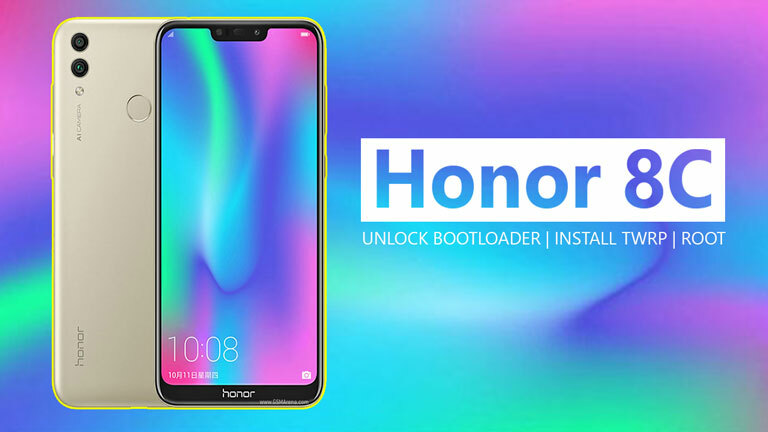 Below I have mentioned the sites from which you can buy unlock code to unlock the bootloader of Honor 8C. Step 5: Once Done Now Connect Your Honor 8C To PC/ Laptop Using USB Cable. Step 7: That’s It 🙂 You Have Successfully Unlocked The Bootloader Of Honor 8C. Now you can Flash SuperSu, Custom ROM, TWRP Recovery, & Custom Kernel. Final Words: So, this is all about How To Unlock Bootloader, Root Honor 8C And Install TWRP Recovery. I have shown you the easiest method to Unlock Bootloader, Root Honor 8C And Install TWRP. I hope this method worked on your phone. If you want to ask any questions related to this post then make sure to comment down below. We would love to hear from you.